Just when you thought you’d seen it all, toilet paper gets political. 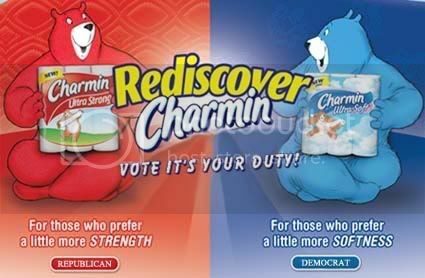 The symbolism in Charmin’s newest commercial, which features two bears, one red and one blue, running against each other in a race could not be any more overt, particularly with the 2008 elections closing in. Deciding on a toilet paper is certainly a tough choice and undoubtedly there will be a lot of torn buttholes out there. But when you go to malls this week, ask yourself do you want a strong reliable toilet paper in the outhouse or a soft wishy washy toilet paper that’s weak on terrorism.